Sometimes it’s hard to gauge which portfolio tracking application is actually good, and which is just intent on using us to sell information about the thickness of our crypto wallets, like many do with personal information of blockchain conference attendees. 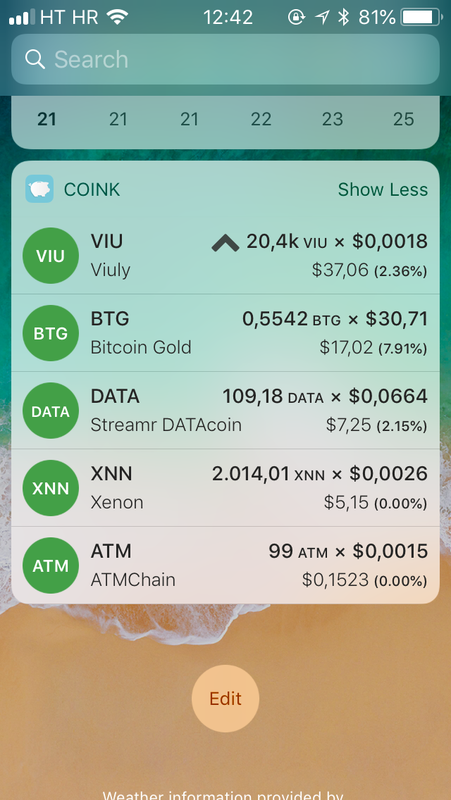 It’s thus our pleasure to present Coink – an iOS application for fast but anonymous tracking of your portfolio or general coin prices. Coink, the name of which is a combination of Coin and oink , offers a very simple interface appropriate for users of all levels of technical literacy. 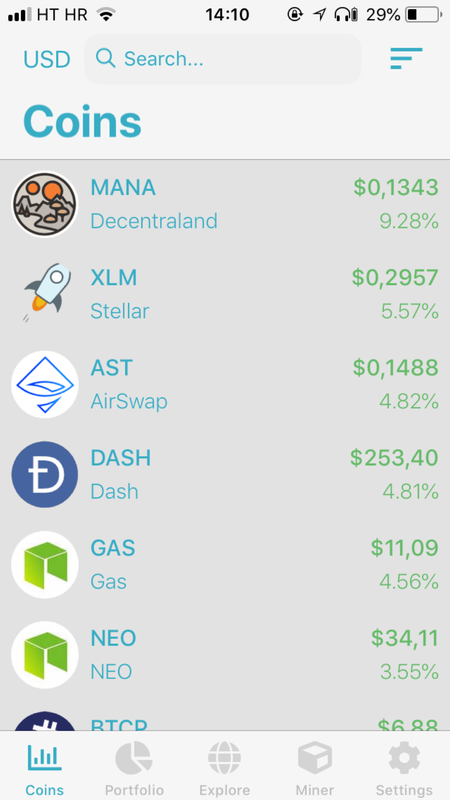 The first screen – “Coins” – gives an overview of all coins with a non-trivial marketcap and/or volume. After choosing a different “Download Mode” in the settings, this list will change and show only those coins selected there, e.g. only favorites. 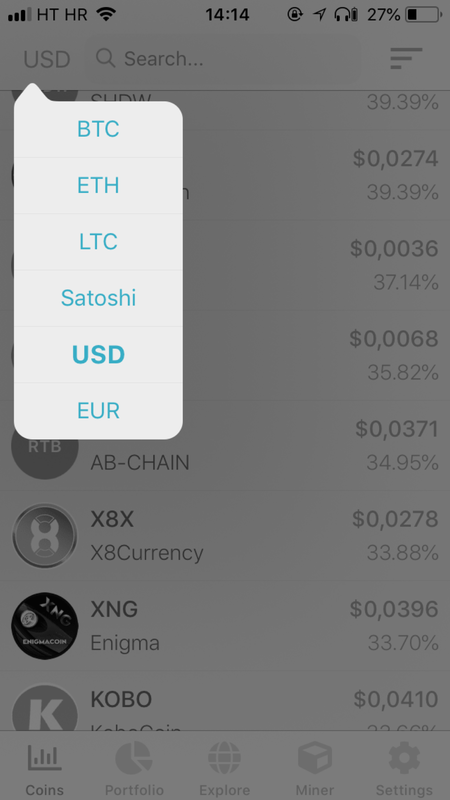 In the top left corner of the screen, you can select the currency in which you want the coins and your portfolio’s value to be expressed – from fiat like EUR/USD to Satoshis (the smallest BTC unit) or even Litecoin and ether. Clicking a currency will let you pick one or both of two options: “Add to favorites” and “Add to portfolio”. 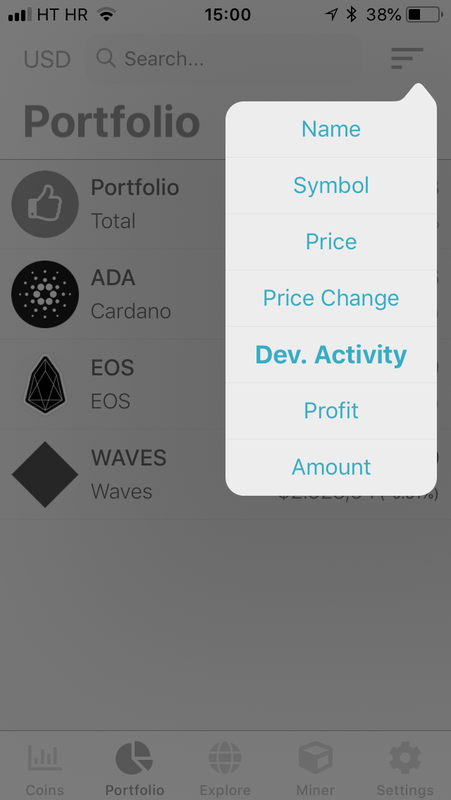 Choosing the latter will let you enter the amount you own while “Add to favorites” will add this coin to the top of the Coins list, changing the layout slightly for faster lookup. 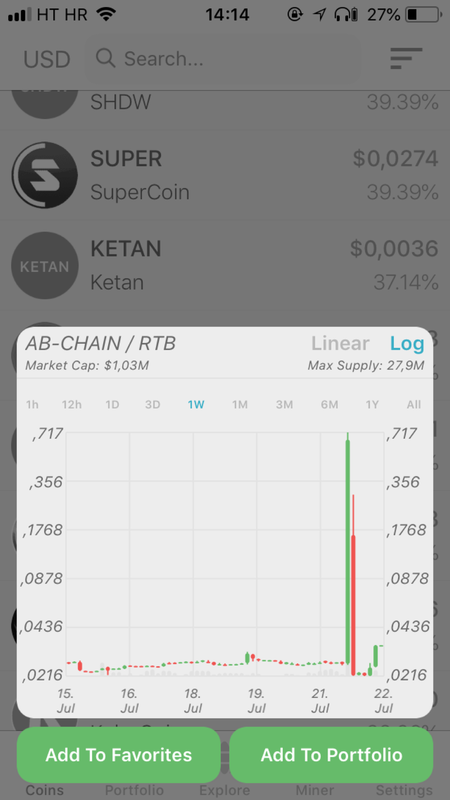 Each coin also has a graph displaying its historical price (swipe left of right for time range) and this is available in both the Coins and Portfolio view. The graph can be shown logarithmically or linearly and will ignore anomalies to produce the most faithful representation of value fluctuation over time. 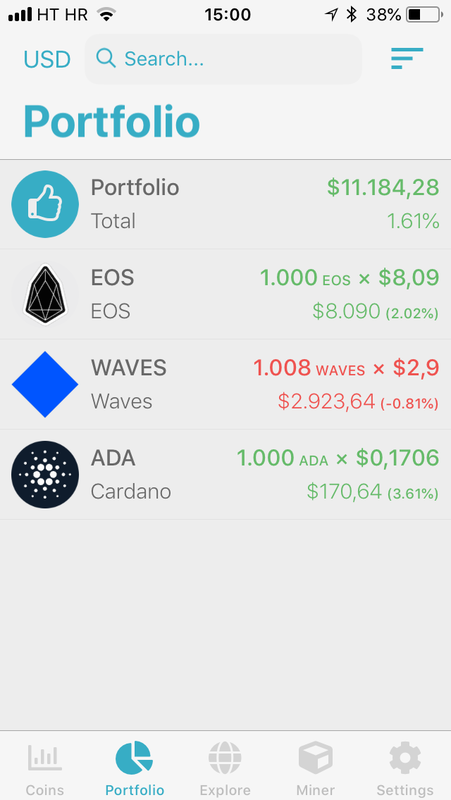 The Portfolio screen will sum all the currencies you’ve added and, along with the 24 hour change of those values individually will also display the total change of your portfolio’s value in the past 24 hours (or more, if you tap on it and scroll through the graph). 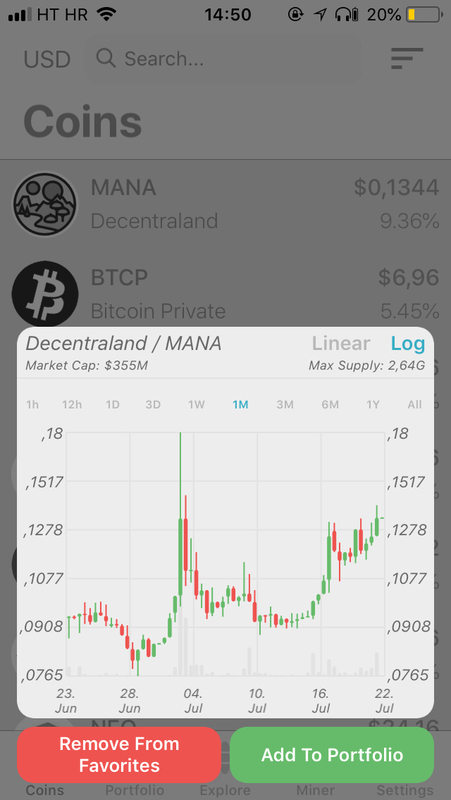 The Portfolio can also be shown in different currencies just like the Coins screen, and the sorting option in the top right corner will let you you sort by price, volume, or even Github activity of the project! 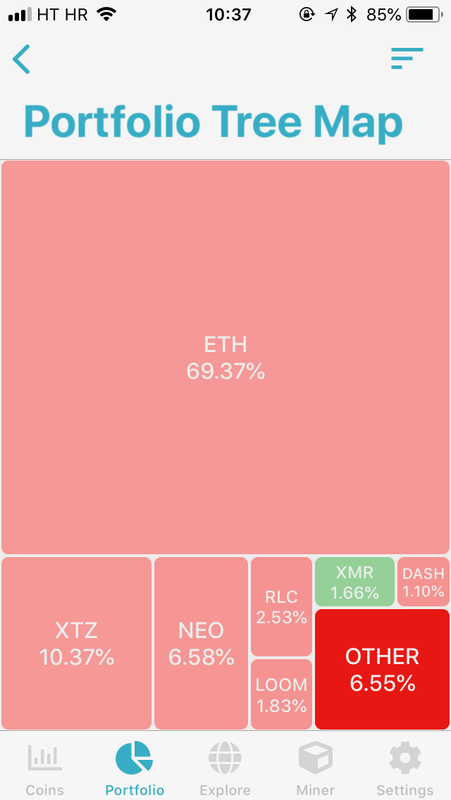 Along with graphs and values, the Portfolio screen can also show you a diversification tree map if you tap on the top line and select “Show Tree Map”. This is ideal for rebalancing of your portfolio. The Explore screen contains articles from some popular web portals, upcoming or current ICOs and other interesting tidbits. 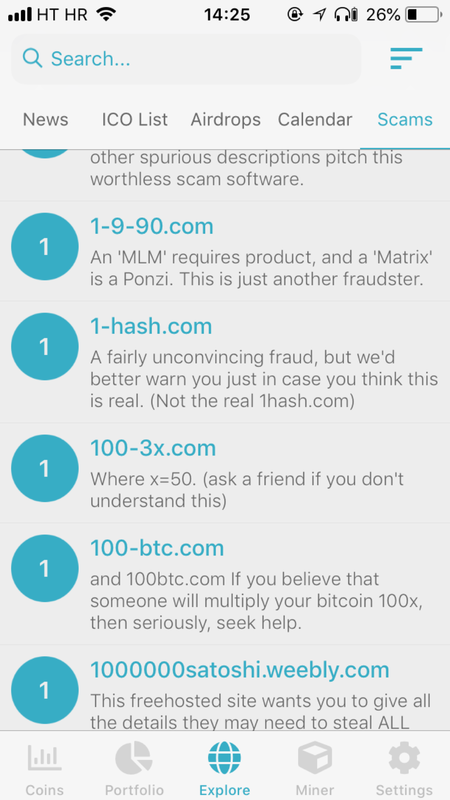 I personally don’t feel like this screen is particularly useful because of the dubiousness of the sources (Bitcoinist, Trustnodes…), but the “Scams” subsection is definitely interesting. It lists most of the currently known frauds in the crypto world. It would be better if it had an option for filtering past vs current frauds because right now the list is only browsable if you’re searching for something specific, and the option to submit new scams would be a pretty great thing too (e.g. CryptoHunt is missing). While computing resources are not stolen without permission from the user, the default settings of the miner only benefit the developer of Coink. This option is, at its default, literally just a way to show the dev your appreciation by donating some of your phone’s resources for a while. 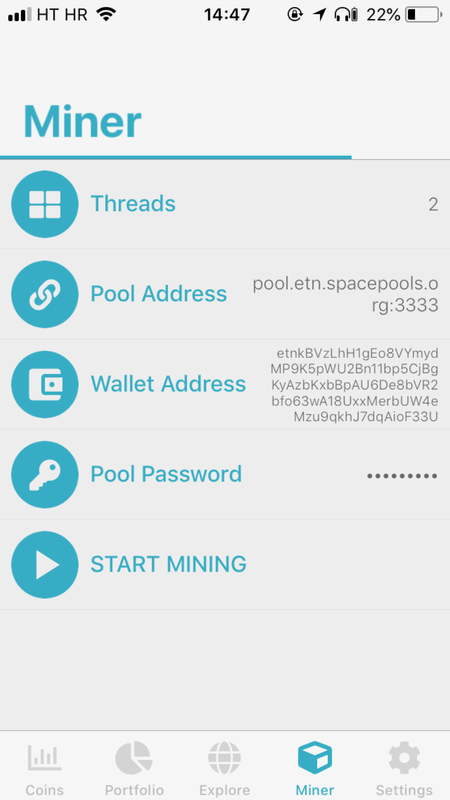 If you donate actual money – either via cryptocurrency of PayPal through the app – you get to change the miner’s settings which lets you make it mine for you. This is practical if you’re on a phone which is always connected to a dock or a charger. This option could be further upgraded if the ability to automatically set up a personal mining profile for people who donate was added, removing a big UX barrier for technically illiterate people, or if there was the ability to add multiple mining profiles with different CPU percentages sacrificed or different addresses. The application also offers highly responsive widgets for both your phone and your Apple Watch so you can keep an eye on your assets at all times. Finally, under settings, we can modify some visuals and pick the Download Mode. 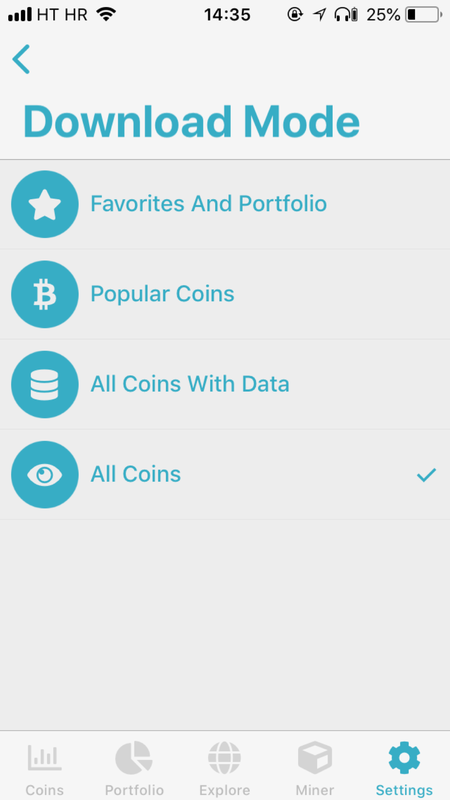 Favorites and Portfolio means only the data for those coins is downloaded on refresh or app boot. This is the fastest option and provides the best user experience, but other coins are then missing from the main screen. Popular Coins only grabs the first few hundred coins from the global list. “All coins” includes even the worthless and dead coins, a full list. This is the slowest approach. For best performance, we recommend using “Favorites and Portfolio” and switching to “All Coins” when you need to add new coins, then switching back to “F&P” when done. The ability to maintain several portfolios for people and entities managing other people’s portfolios or who have folios for different purposes like day trading vs hodling, etc. The ability to enter a NEO or Ethereum address and the app auto-downloading the tokens and balances from the addresses, adding them to the portfolio. For example, if I enter 800 OMG manually and then add an Ethereum address with 1000 OMG, I want the next status to be 1000 OMG. Even better, the ability to define stacking type – if I manually add 800 (because I have them on Bittrex, for example) and an address with 1000, the new status could be 1800 based on an option in the Settings. All in all, Coink is an excellent and useful new aplication for tracking your portfolio. Other than impressive performance (which is arguably the most important feature in an app designed for quick checking of values), its greatest advantage lies in its simple UI and the responsiveness of the developer: bugs and complaints are quickly addressed.